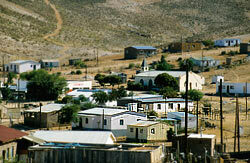 The small settlement of Lekkersing, established in 1926 by Ryk Jasper Cloete, lies 60km east of Port Nolloth. It is said that its name (which means to sing joyfully or beautifully) originated from the fact that a small fountain in the area �sang� so beautifully that an early resident promptly named the village. Incidentally the residents of Lekkersing are very good singers! Close to the town an exquisite red sand dune also �sings� after a rare rain and can be clearly heard resonating in a deep and ancient voice. The diamond quartzite Stone Mine in Lekkersing was established in 1964 and has produced exquisite slabs of stone in earthy reds and gold, used for tiling all over the world. Extraordinary dendrite formations are sometimes visible on these natural slates. The dendrites are patterns that look extremely similar to plant fossils, but they are in fact far older and have the same chemical composition as the snowflake crystal. Despite the fact that Lekkersing is also part of the arid semi-desert region, where rainfall averages 50mm per year, it is the home of the Protea Elderly Club Food Garden. 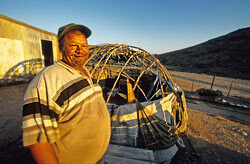 One of the greatest success stories of community development, the garden was established in 1999. The project has created employment and supplies vegetables, fruit and herbs to the community. It was acknowledged as the best garden in the Northern Cape Province and has won 2 prizes for this reason. A walk or a donkey cart ride will unveil the Skurwehoogte caves nearby, the fragrant Lekkersing shrubs and juicy succulents, and the places where small settlements were found thousands of years ago. Local arts and crafts are available at the Rusoord Club for the Elderly. Visit the nearby Kalkfontein farm for an invigorating hike, or for horse riding and bird watching. And please don�t forget to ask someone to �sing joyfully� to you or tell you a legendary story over a dish of traditional Nama food, prepared with old style hospitality by the Nama Cultural Group with the fresh home grown products of Lekkersing�s food garden.